Sugarloaf has been called The North Bay’s Castle Rock. Although it’s nowhere near as good in quality or quantity of bouldering to its South Bay compadre, the park does have a similar vibe. 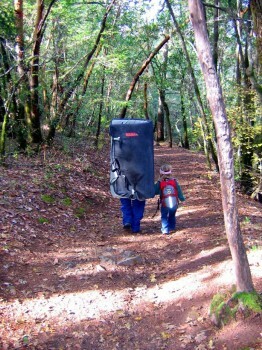 Well-maintained trails embraced by redwood forests lead you to almost every boulder in the park. The boulders are a mix of three different types of rock. The first type is a solid pockety volcanic and is the most common. Second is a softer knobby volcanic that is found at the Lower Canyon Trail Boulders. Third and least common in the park is schist. The boulder problems are on varied angles from short and steep to high and slabby. Which SuperTopo guidebooks cover Sugarloaf Ridge State Park? Val and Holly Hike Canyon Trail.